Keep track of all your conference activities, plan your schedule and much more. 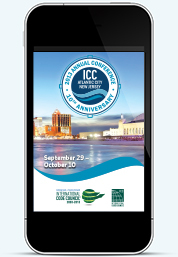 ICC’s Annual Conference App is now available for Apple and Android devices. Even if you cannot make it in person, ICC’s Annual Conference App gives you an easy way to access and watch the hearings as they are streamed live as well as keep abreast of happenings at conference via ICC’s Twitter feed.